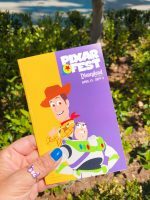 Pixar Fest at the Disneyland Resort has been such a blast! There have been exciting new events and tasty new treats to see and try. 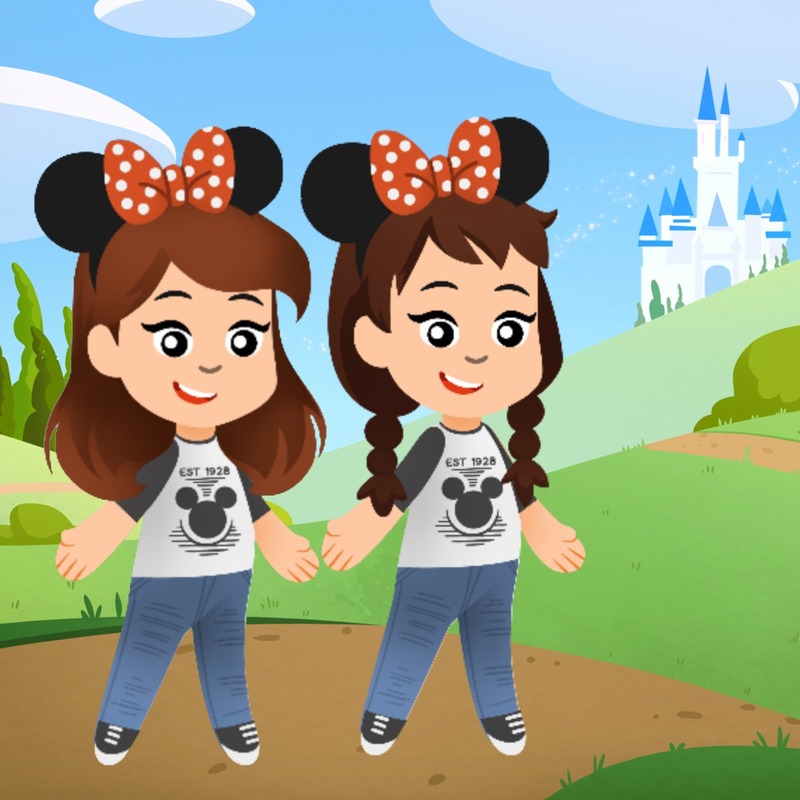 However, hardly anyone is talking about the ADORABLE merchandise that is available right now! And believe me when I say, you will want EVERYTHING that they have to offer. So be careful….your wallet may not like you later. These items are available all over the Disneyland Resort, but we will mention where we personally noticed them. 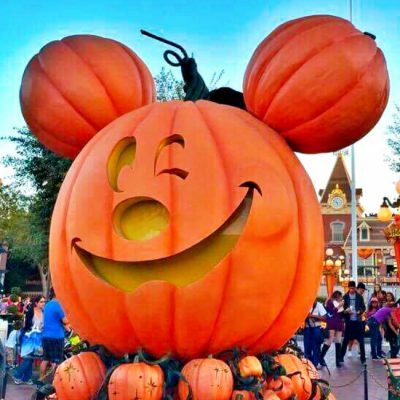 Whether it’s interchangeable bows for your Minnie Ears, accessories, or clothes, you can be sure to find something that’s just for you and your personal style. BOWS, BOWS, and MORE BOWS! 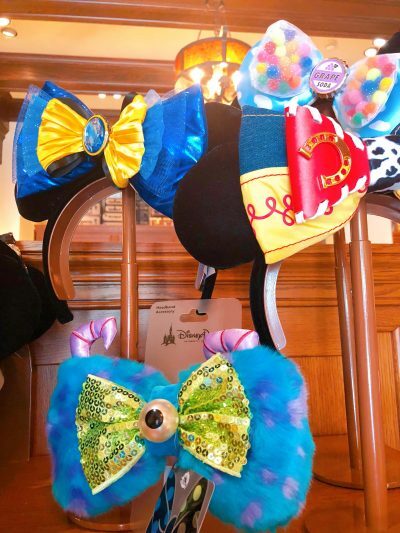 These are specifically design for the interchangeable bow ears that were first introduced at last years D23 convention. However, I have used them just as clips in my hair and they work perfectly. These were purchased at Elias & Co. on Buena Vista Street in California Adventure. Did we mention BOWS?! 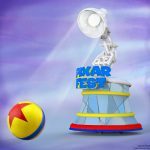 Whether it’s Toy Story, UP, Monsters, INC., or Finding Dory, you can be sure to find the Pixar bow that best suits your personality. 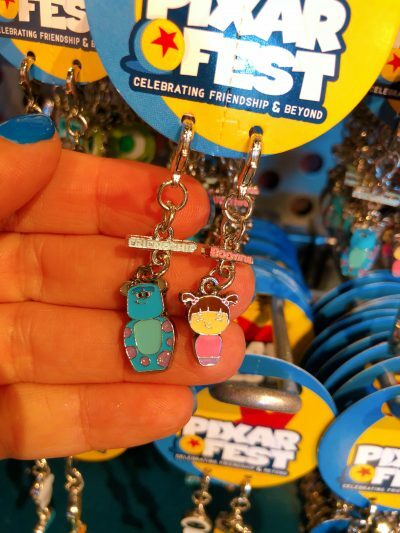 Pixar Fest has been all about the importance of friendships! The jewelry that is available highlights just THAT! Each pack comes with two charms and two bracelets that is meant to be shared with your best friend! These photos were taken inside the Little Green Men Store Command, next to the Astro Blasters ride in Tomorrowland. I mean come on guys! How cute are these?! 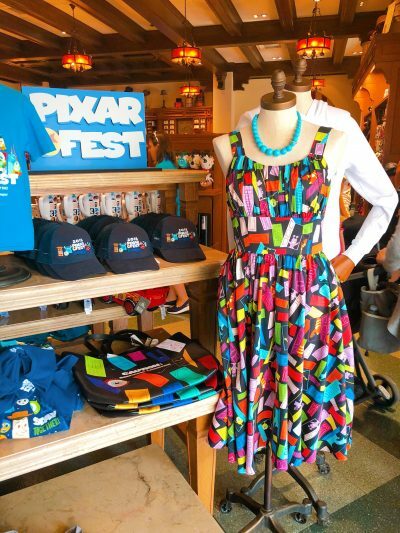 What’s better than a shirt depicting a castle filled with Pixar characters?? 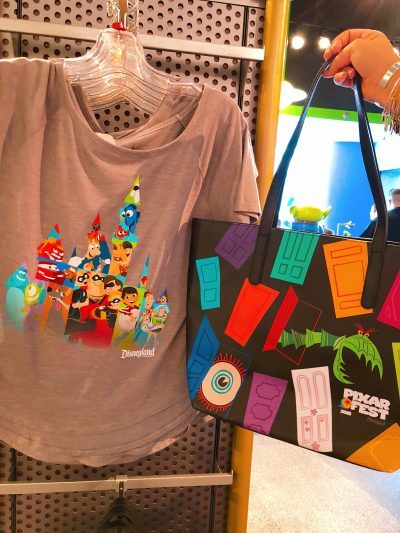 Oh how about a Monsters, Inc. Pixar Fest Tote Bag?? 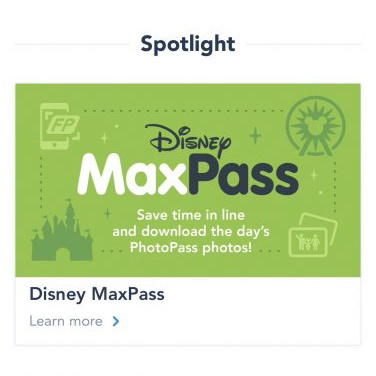 A MUST-HAVE for any Disney collector for sure! 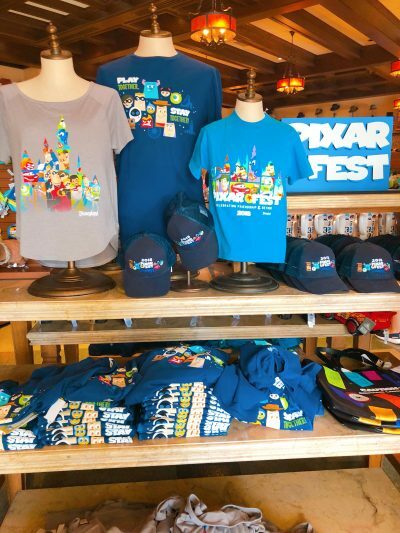 As if it couldn’t get any cuter, but bring in ALL of the different Pixar Fest shirts and matching hat. In different styles and sizes, these items are a must see to truly appreciate. All of these items were found in Elias & Co. shop on Buena Vista Street in California Adventure and the Emporium on Main Street in Disneyland. Do you like to be fancier than just a t-shirt and a hat?? 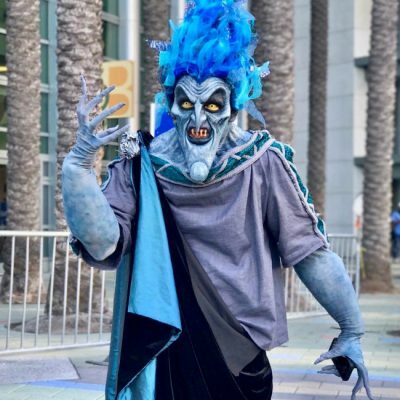 Look no further than this amazing Monsters, Inc. inspired dress! Our jaws dropped when we saw this beauty. 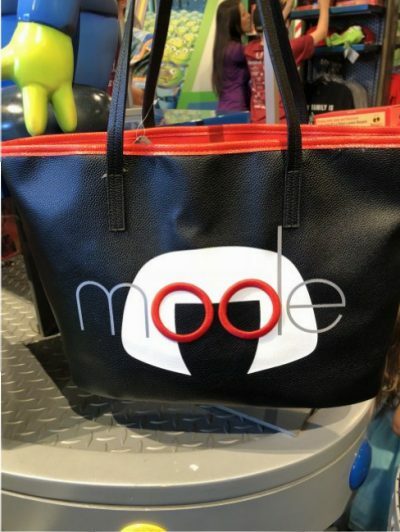 Pair it with the adorable tote bag and you have a classy look that will make everyone asking where they can find it! 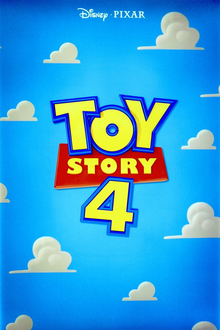 Want a piece of Pixar art or nostalgia decorating your home? 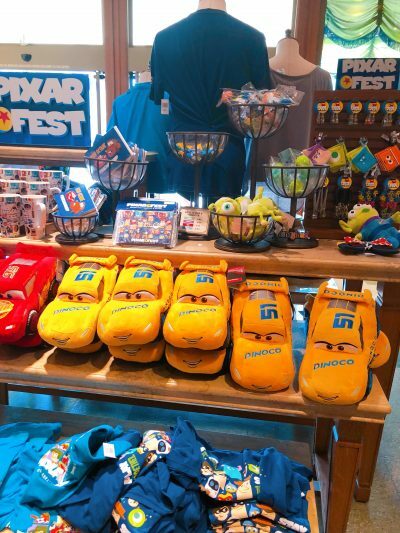 The Disney merchandising team has got you covered. 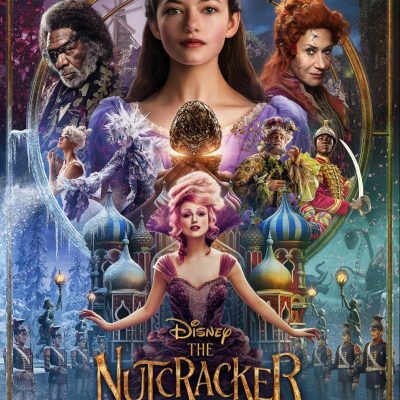 This poster is gigantic and so incredibly colorful. It comes rolled in a tube so you would have to frame it yourself…but this would be the finished product! And we cannot get enough of it! 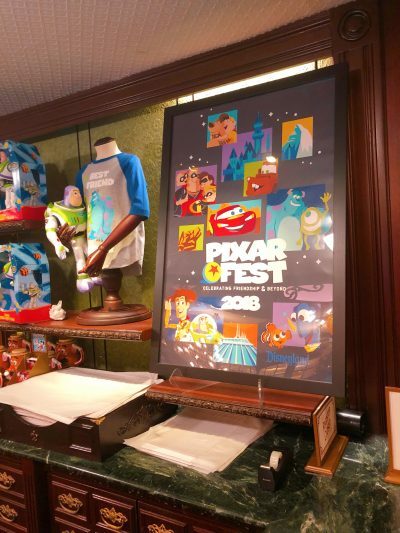 Check out the display in the Emporium on Main Street. For a little more up-scale look, take a look at these! From paintings, drawings and photos to figurines and ornaments, there is something for every style home. Go take a look inside the Off The Page shop in Hollywood Land in California Adventure for these breathtaking pieces of art. 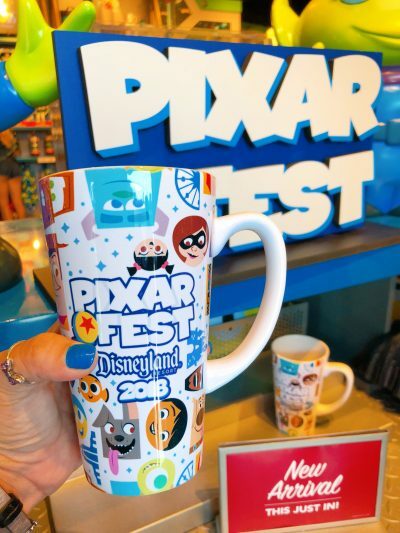 Besides clothes, Cups/Mugs/Tumblers are the hot ticket item for Pixar Fest! 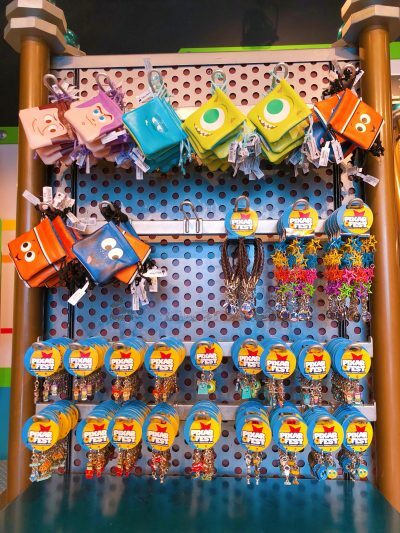 Head on over the the Little Green Men Shop Command for all of these festive items. This Ceramic Mug is quite possibly one of the most beautiful pieces of glassware in the parks. It is the perfect souvenir! 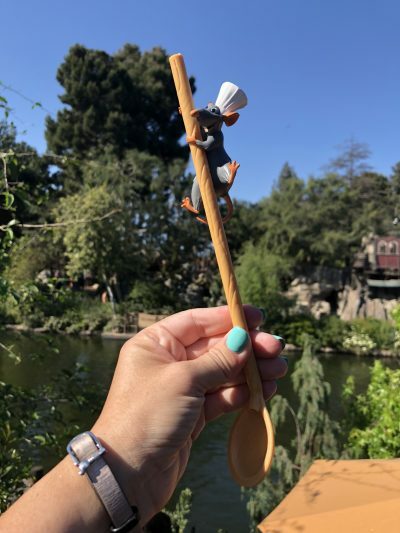 It was also so good to see “Ratatouille” represented in this adorable Sipper/Stirer Spoon !! 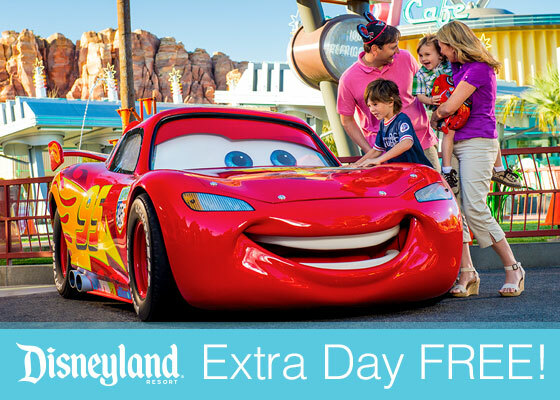 Only available at limited locations in the park, it’s worth asking around for! We got ours at the Lemonade Cart next to Haunted Mansion. Did we mention MUGS! 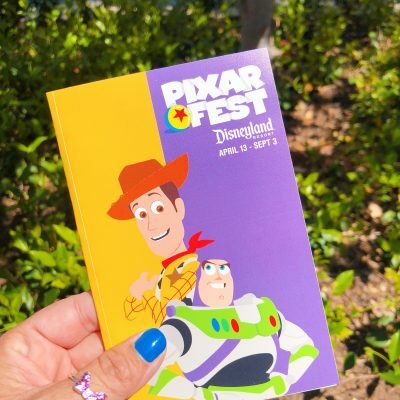 Combine this collectors item with a Pixar Ball Straw and your life will be complete! 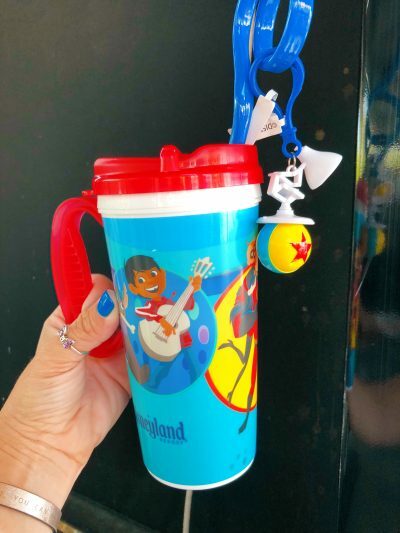 This mug and straw were located at the Gourmet Coffee cart next to the Pier in California Adventure. 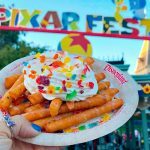 Don’t forget to wear your Pixar Fest hoodie while sipping from Mr. 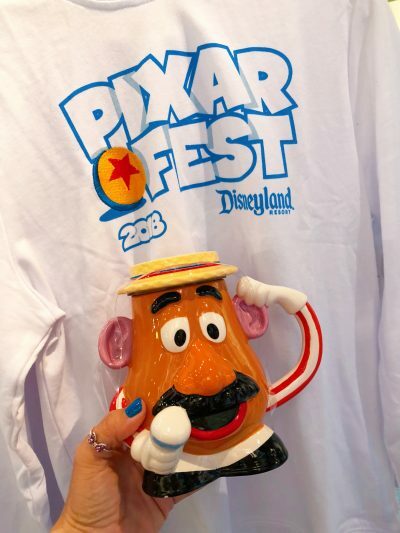 Potato Head’s mug! These two make a super combination! These tumblers have been incredibly popular. Why wouldn’t they be though?? 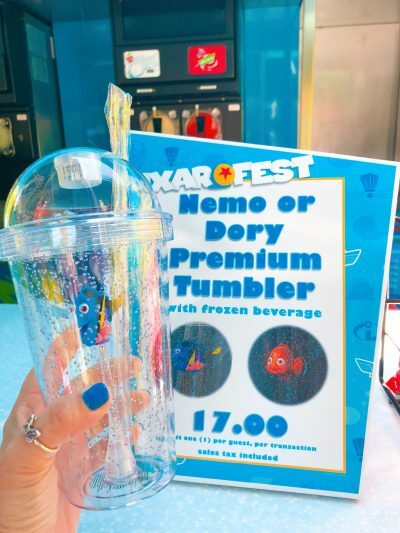 Little Dory and Nemo in the middle of your drink! Cute! 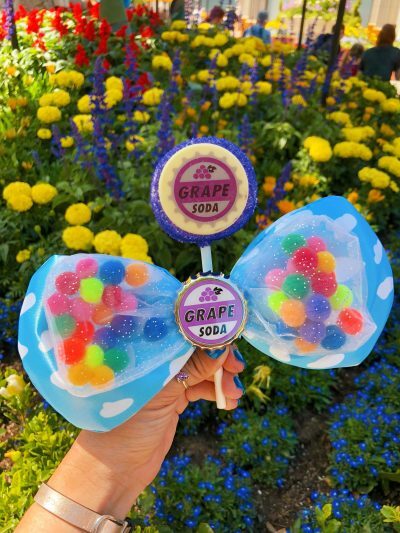 They were nearly impossible to find but we discovered them at the Slushy stand in Bugs Land! Grab one before they run out! Don’t forget to grab your popcorn buckets!!! 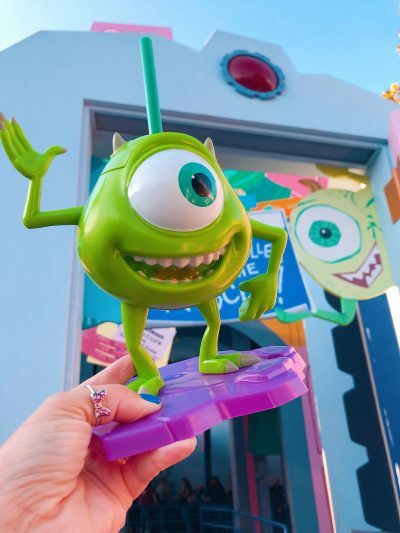 Along with this exclusive Annual Passholder Alien popcorn bucket, you can find Sulley from Monsters, Inc. and a few other “Incredible” ones that may be coming in June! Keep your eyes peeled! 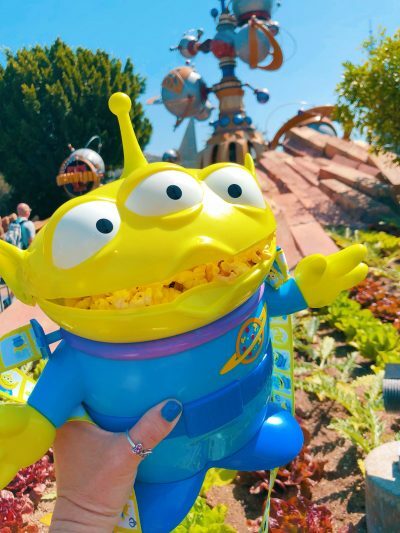 We found this one at the popcorn cart on Main Street in Disneyland! And what good is a popcorn bucket without a nifty sipper to go with it! 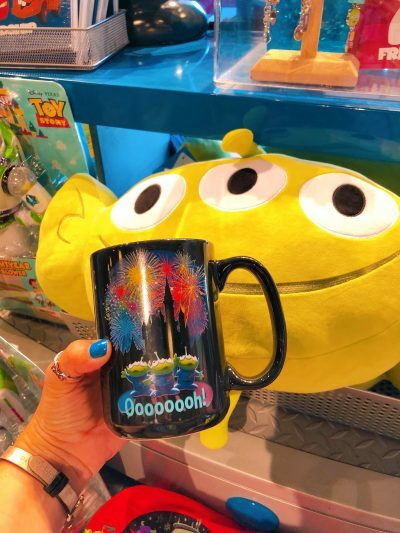 This particular Mike Wazowski sipper cup can be filled with your favorite beverage and also connects to the Sulley popcorn bucket, showing that they are truly inseparable friends. Pick one of these sippers up at the Fairfax Market in Hollywood Land in California Adventure. 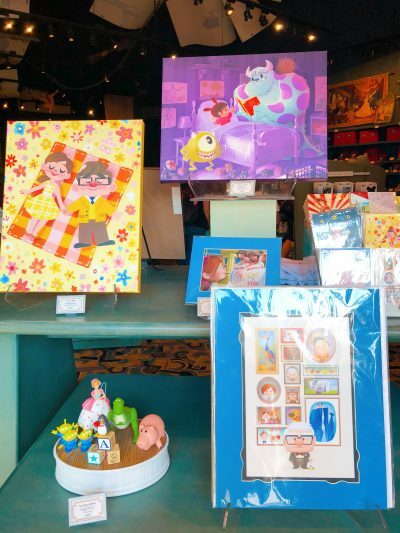 Along with a bazillion toys and plushies, there is also a plethora of practical items available…..magnets, books, cards, pens, and autograph books just to name a few. Basically anything you are looking for, we’re sure you’ll find it. I hope these items make you as excited as they made us! 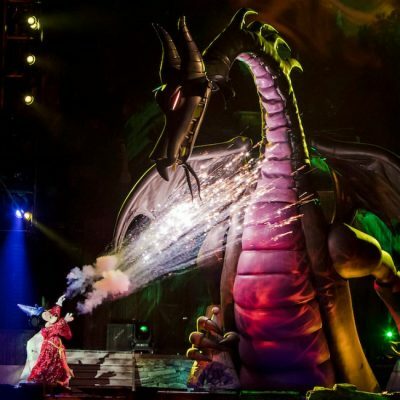 Disney definitely knows how to kick it up a notch when it comes to merchandise. Happy Shopping!